Goff students learned all about galaxies in their science classes, following in the footsteps of famed astronomer Edwin Hubble. 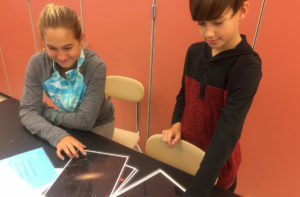 The students used photos that Science teacher Marian Roohan brought back from a free workshop she attended at Siena College this summer to learn about the different properties of galaxies and identified the location of our solar system. “They had fun doing real science!” Mrs. Roohan said. At the workshop, Mrs. Roohan learned about the latest cutting-edge research areas in astronomy and astrophysics. The activities were organized around the Next Generation Science Standards and led by Siena Physics Professor John Moustakas and Dr. Valerie Rapson from the Dudley Observatory at miSci.